It's definitely still winter, but spring is only a few weeks away! As the weather changes from season to season, it is a good time to run a few checks on your plumbing system in order to catch any issues and prevent any problems from popping up. Our last article covered how to protect your home in the winter. This time, the expert Master Plumbers at Kenwood Plumbing offer some recommended tips to protect your home and prep it for spring. It is probable that your sump pump has been inactive for a few months recently. Although Minnesota has had some warmer days this winter, in general spring and summer are the workhorse months for our sump pumps. Sump pumps see a lot more action when spring comes and the rain starts to come down in earnest. It is a great time to test your sump pump to be sure that the winter inactivity didn't compromise the system. Snow melt alone is enough to cause some serious water problems in Twin Cities' basements. To test it, follow the instructions below. If there are any issues, contact your plumber as soon as possible in order to get everything working before the next rain storm. Sump pumps are often installed in a crawlspace or basement below the floor to defend your home against a flood or accumulating ground water. A sump pump also removes collected condensation created by your air conditioner and water from areaway drains, preventing moisture from collecting around the foundation of your home or in the floor of your basement. 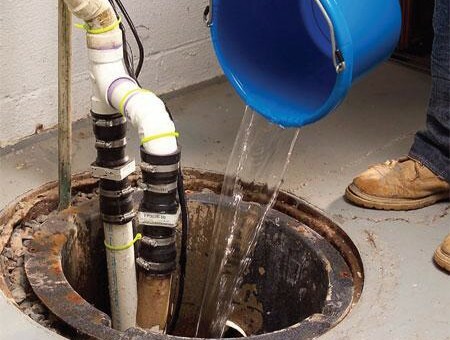 Test your sump pump periodically to ensure it is working correctly to protect your home against water damage. Find the outside pipe that catches the water as it drains from the pump. Check the inside for any obstruction or debris. Take the lid off the sump crock. Slowly pour water from a 5-gallon bucket into the crock. Keep your eye on the sump pump switch. It should turn on and begin to pump water from the crock. Wait until the water pumps from the crock to ensure the pump turns itself off, then slowly pour the remaining water in the crock to ensure the pump turns on again. Winter tip: In our MN climate where we have long periods of cold with snow and ice, check for ice inside the pipes and get rid anything clogging them. Indoor or outdoor pipes can easily freeze when temps are below freezing (or below zero!) for extended periods of time. With cold like ours in the Twin Cities, pipes can develop cracks. Look in your yard for wet areas, or bog-like sections of your yard that aren't draining. This could indicate an underground pipe leak. After you make sure there aren't any leaks underground, it's time to check your home for possible leaks. Turn off all faucets and check the reading on your water meter. After waiting an hour, check the water meter again. If the reading on the water meter has changed, this is a sign that your house has a leak. Your toilet is a prime suspect if your home has a leak. To check, turn off the toilet's water supply valve usually located near the base. If your meter isn't sensing a leak, or if the leaking sounds cease, it indicates that your toilet was the source of the problem. Spring plumbing prep is a good time to remove the mineral buildup from your bathroom shower heads. Certain parts of the twin Cities are notorious for hard water. The minerals build up over time, which can cause problems and blockages if not removed. Fill a small plastic baggie with vinegar, and attach the baggie to the shower head using a rubber band. Leave the baggie on the shower head for an hour, then remove the baggie and use a plastic scrub brush to wash away the hard water stains on your shower. Some people turn up the temperature on their water heater for the winter, thinking it is necessary to warm up water faster in the winter. As time goes on, this can really reduce the efficiency of your water heater and wear out its parts. To reduce the workload on your mechanical, turn down the temperature on your water heater when the weather warms up. Spring is a good time to perform another vital piece of maintenance to your water heater. Drain the sediment in your unit in order to keep your water heater functioning properly. Click here for a good video of how to do that. The last check is an easy test of your exterior faucets that may have sustained freeze/thaw damage during the frigid MN winter months. Turn on the outside faucets that connect to your outdoor hoses. Let them run for about ten minutes. If you don't see anything amiss, you're all set. Contact Kenwood Plumbing for Repairs and New Installations in the West Metro! Kenwood Plumbing is ready to help you get your home ready for the challenges of spring. To make an appointment, contact us today at 952-249-6686.